This fantastic life-size, swashbuckling Lady Pirate with Treasure Chest model looks great with our range of pirate figures and props in a Caribbean Pirate Island theme. This stunning Lady Pirate with Treasure Chest figure is sure to attract a lot of attention wherever she is used. This resin statue is full of sumptuous detail, from her highly decorated boots, one of which rests on an over-flowing replica Treasure Chest, to the parrot on her shoulder and a jewel encrusted cutlass, this is one Caribbean pirate not to mess with! 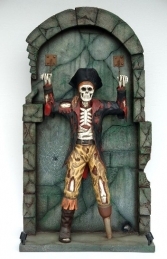 This model can be used in any pirate themed area or in shops, businesses, pubs, restaurants, coffee shops, adventure golf courses, zoos, theme parks or would even look fabulous in your own home or garden.